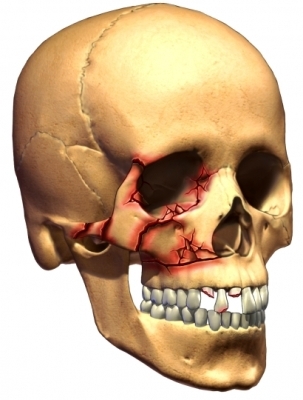 Facial trauma refers to injuries of the facial skeleton involving the mouth, face and jaws. It includes injuries such as broken jaws, eye socket, cheekbones and nose. Injuries to the face, by their very nature, impart a high degree of emotional, as well as physical trauma to patients. The science and art of treating these injuries requires the highest level of specialist training in order to comprehensively understand how the treatment provided will impact on the patient's long term function and appearance. These complex injuries require accurate and prompt assessment by an Oral and Maxillofacial Surgeon who specialises in facial injuries. Dr Webber is one of the most highly skilled and trained Surgeons in his field for facial trauma reconstruction. This follows him spending 12 months working at the R Adams Cowley Shock Trauma Centre in Baltimore, Maryland, USA in 2009 on complex facial injuries including gunshot wounds. Many patients receive less than ideal treatment of bony facial injuries following initial surgery. In these instances secondary, or delayed, correction of trauma-related facial deformity may be required to address facial appearance, vision and chewing. This can consist of scar revision through to corrective bone surgery. Dr Webber completes secondary corrective surgery with the aide of computer 3D planning and models and, if necessary, will engage a highly skilled multidisciplinary team to ensure the best possible surgical outcome. For further information please contact us or call 07 5527 8858.